I’m soooo excited to be a Guest Designer for the LAST of the All-Star Holiday Season. For the past several months the CAS Design Team Alumni have been ‘back in action’ helping out. This week is the last week and my last time as a Guest Designer. I do just LOVE the CAS challenges! The theme for this challenge is snowflakes. Although the SU Holiday Mini is over, you can still get the Festive Flurry stamp set and matching framelits so I decided to use that for my CAS card! I did though decided to make it just a general winter card and my FAVORITE snowflake colors…pink and silver! Yep…that REALLY is my VERY favorite! Whisper White 4 1/4 x 4 1/2. Stamp the greeting in Versamark and Silver Emboss. Add a Silver Glimmer Scallop edge 4 1/4 x 3/4. Add panel to card front using dimensionals. Stamp snowflake using Versamark, Silver Emboss, cut out with matching Festive Flurry framelit, cut out snowflake from Pink Pirouette using same framelit. Layer together using dimensionals, add to card front sing dimensionals. Punch out middle Boho Blossoms flower in Pink Pirouette. Add to center of snowflake. Add Jumbo rhinestone to center to finish it off. 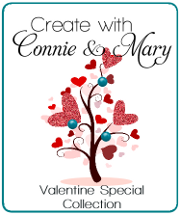 And just like it’s not too late to get the Festive Flurry set and matching framelits, it’s not too late to subscribe to the Create with Connie and Mary Valentine Special Collection and get 4 exclusive ideas (2 card sets and 2 3D projects) using the Whole Lot of Love Valentine Collection from Stampin’ Up! All 4 tutorials for only $5.95! All four projects have already been released, so if you are looking for some exclusive ideas to use for your classes (we do not post our projects anywhere else), this is for you! So head over to the Create with Connie and Mary site to learn more about our Mini Collection and SIGN UP TODAY!!!! It’s not too late! This entry was posted in Challenge, Clean and Simple (CAS) and tagged Festive Flurry, Six Sided Sampler. Bookmark the permalink.